Our first family pet was born on St. Patrick's Day, and while she passed away several years ago, we always honor her with a little treat every March 17th. When Ms. Whiskers was still around, we usually made a birthday cake, with either the icing, cake, or both dyed green and served with a cup of green milk. Yes, my older sister insisted on dyeing our gallon of milk green for the week of St. Patty's Day. Ms. Whiskers got a giant lick of icing off my finger while we sang Happy Birthday to her, and we all got to enjoy the rest of the cake. This year, we kept up with tradition, but forwent the artificial dyes and the whole birthday cake, opting instead for little puddings with a naturally colored minty green layer and a chocolate layer. A crunchy cookie-like layer makes these taste like minty dirt cups. In all honesty, I was hoping that the green layer would be a little more vibrant and just a little more enticing, but after multiple attempts to make it brighter, I will settle with the murky green I got instead because taste trumps visual appeal in this case. If the green proves just too vegetable-like for your liking, forget the two-tone layers, turn this whole thing into a minty chocolate pudding and my feelings will not be hurt. Chia seeds and avocado help thicken the pudding. Spinach provides a little green and a nutritional boost that I promise you will not taste. I used dates for sweetness not only because I love their caramel-like flavor, but they contribute additional fiber. Honey makes a wonderful substitute and is actually a little easier to blend in this recipe. The crumble can be doubled or tripled and then sprinkled on whatever you can get your hands on. It is reminiscent of those Nabisco chocolate wafers but a bit nuttier. And It definitely melts in your hand so as tempting as it is to eat by the handful, I recommend grabbing a spoon instead. Begin with the cookie crumble. In a small skillet over medium heat, heat the coconut oil. When it has melted, add the almond meal, cocoa powder, honey, and pinch of salt. Stir thoroughly to combine. Allow the mixture to melt and meld together. Cook over medium-low heat for about 5 minutes. Remove from heat, spread mixture in a thin layer on a plate or piece or parchment. 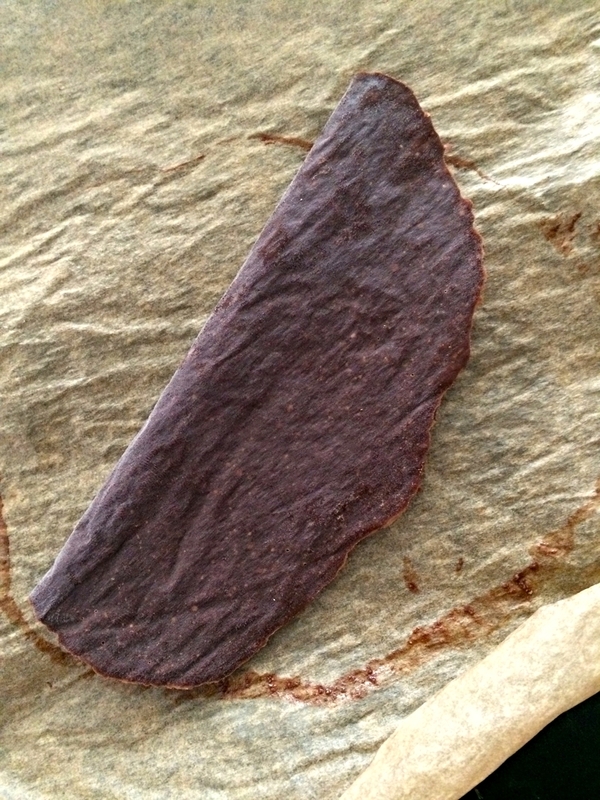 I placed the mixture on a piece of parchment and folded the parchment over to smooth into a thin, even layer. Place it in the freezer for about 10-15 minutes to harden while you prepare the puddings. For the puddings, make the green layer first. Add the coconut milk, fresh mint, chia seeds, avocado, spinach, dates (or honey), and vanilla extract to a blender and blend until smooth. You will have to stop often to scrape down the sides, but it will eventually come together. If you are really having trouble, add more liquid, 1 tablespoon at a time, to help blend. 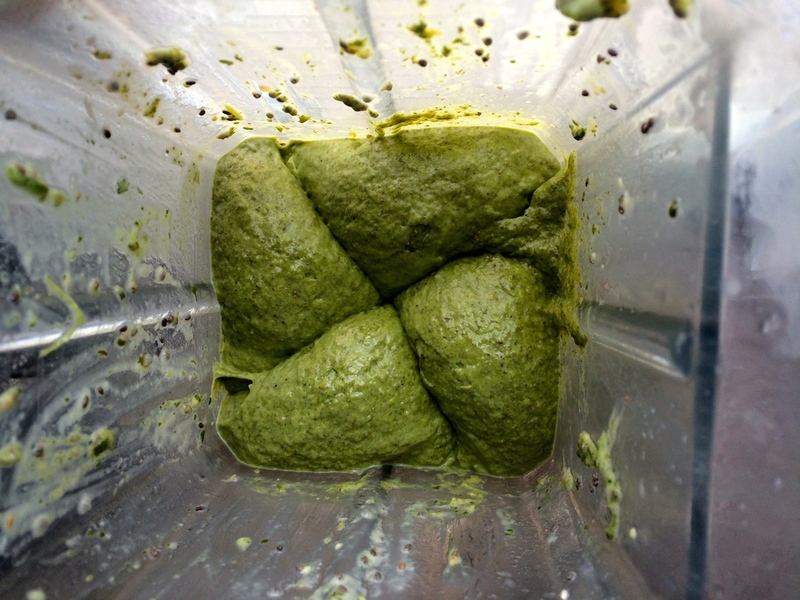 Remove half of the mixture from the blender and set aside in a small bowl. To make the chocolate layer, add the 1 tablespoon + 1 teaspoon of cocoa powder to the blender, and blitz to combine. When the chocolate almond mixture has become firm, remove it from the freezer and chop into small crumbles. Place 2 teaspoons of the crumbles in the bottom of each of two glasses. Top each with half of the green pudding. Add 2 more teaspoons of the crumbles to each glass, and then top each with half of the chocolate chocolate. Finish each with the remaining crumbles. Place the puddings in the refrigerator for at least an hour in order to firm up and become chilled. Enjoy! Serves 2.